Today's blog post is very special. Well, the person who wrote it is at least (to me, haha). This #ahasmember is my husband. He has had his own shop for a year now and we finally got to having an open house in August. So I thought it would be a good time to wrangle him in for a shop tour. It was hard to do because as you can see from the responses below he is a man of few words (which is why I am stuff it full of photos). That said, I did want to mention that I think having your own space can really make a difference for certain businesses. It's not easy carrying the extra rent always, but I feel like we've made that space a priority. Things would really have to be going down hard for us to abandon it (this is also partly because, oy!, moving all those machines). I think sometimes in the interest of budgets or saving a little bit here or having a bit more security, we can cut down our businesses. Whatever it is that makes your business work a little bit better, makes it a bit more enjoyable to do... I would encourage you to fight for it! Have you invested in something like a shop for your business that you feel like has made a huge difference? Let us know in the comments! 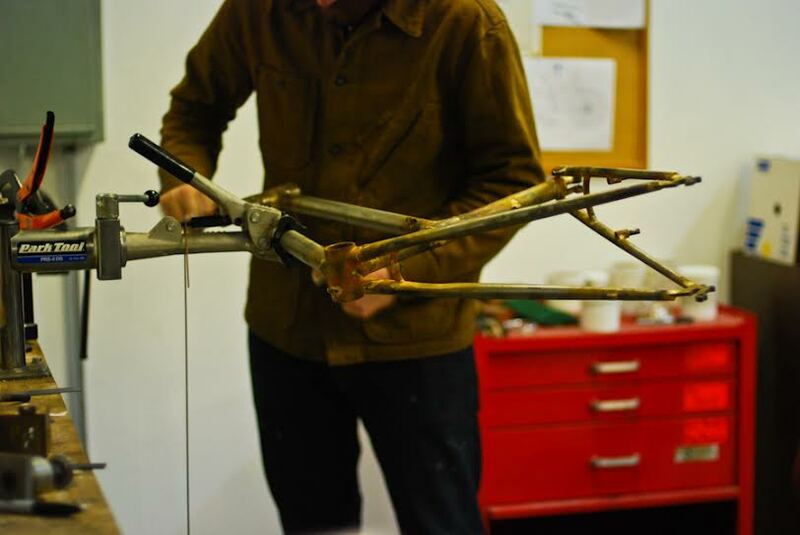 A: I am Jared Jerome, of Jerome Cycles, and I make handmade bicycle frames and components made to specifically to fit your body's measurements. I've been making bicycles as Jerome Cycles for about 3 years, and have been making bicycles on and off for about 10 years now. Q: What sort of workshop setup do you have now and what was your setup like before? A: Currently I have about a 900 square foot shop in San Pedro next to the Port of Los Angeles. I believe the building is about 80 years old. It used to be cold storage for fishies coming in from the Port. I share it with my longtime friend, Jonathan Garcia, who assembles hand built wheels. I like old machines, and new and old tools, so I'm not so much a minimalist as some people are when it comes to my process. My basic set-up is I have two horizontal mills (one with vertical attachment), a small lathe, a TIG welder, a torch set up, and a bunch of bike specific fixtures and tooling. Previously I shared a shop in the city of Vernon (Hell; also seen on True Detective. You can tell when you're getting close from the pleasant scent. ), which is a very industrial area of LA. It was extremely dirty and I'd just end up cleaning tools all day. Q: When did you know you needed your own space? A: When I realized I was just cleaning tools all day. Q: What's been the biggest surprise about having your own shop? A: It filled up much quicker than I had thought, and I need an air compressor. Q: Why has having your own shop been worth it for your business? A: I like having people visit now. I don't feel like I have to apologize for the smell and heat. It's also nice to be able to get into your zone and not have anybody around to distract you. Q: What is your favorite thing about having your own shop? A: I can listen to bands like Converge all day [editor's note: this is a heavy metalcore band that he isn't getting to listen to at home all day] and there's a pretty sweet neighborhood market across the street. It also stays pretty cool in San Pedro, considering it is in Southern California and all. Q: What advice would you give to a maker contemplating their own space? A: If you can make it work, do it. You can make it yours and you can do whatever you want in there (as long as it's legal). A: Thank youuuuuu! And any members who are in the area are always welcome to swing by and say hello.